New report by Coltura finds reality does not meet up with rhetoric when it comes to reducing carbon emissions in the state’s transportation sector. Seattle, WA – June 1, 2018 – A new report, Recharge Required, reveals an overwhelming lack of compliance with Washington’s public fleet electrification law, RCW 43.19.648. Less than one percent of the more than 30,000 vehicles owned by the state, cities, counties, and other public entities are electric vehicles (EVs), and only four of the 31 local governmental entities surveyed have plans for electrifying their fleet. The failure to electrify government fleets contrasts with the law, passed in 2007, which requires government entities to satisfy one hundred percent of their fuel usage for operating publicly owned vehicles from electricity or biofuel, to the extent practicable. The release of the report coincides with a June 1, 2018 deadline for compliance by all local government entities. The first phase, which went into effect June 1, 2015, held all state agencies to the same requirement. 350 Seattle, Carbon Washington, Drive Electric Washington, Plug-In America, and Stand.earth have signed on as supporters of an “EV First” policy requiring that all new public fleet purchases be EVs unless there is a demonstrated need to purchase a gas vehicle. · Electric vehicles are practicable: According to the City of Seattle and State of Washington’s own analyses, EVs such as the Chevrolet Bolt and Nissan Leaf are less costly to own than gas cars. Cost is the key determinant of practicability under state law. · Lack of compliance and accountability:Due to a lack of resolve, resources and accountability in enforcing the law – along with low awareness about the law itself amongst the public, fleet managers, and state leaders – Washington state government, cities, and counties have not purchased EVs to the extent practicable. · Guidance and enforcement not in place: The Department of Commerce, tasked with enforcing RCW 43.19.648, is not providing effective oversight or guidance to public entities. Annual, legally-mandated reporting by state agencies and local governments on progress implementing the fleet electrification law has not occurred. o A full inventory of 42 public fleets is included in the report. Washington’s vehicle electrification law was designed to overturn a century of fossil fuel dominance in the state’s transportation sector. Since it was signed into law, practical and affordable electric vehicle model options have expanded across all key vehicle categories including passenger vehicles, SUVs, pickup trucks, and in many classes of heavy duty vehicles such as transit buses. In many cases EVs have become more cost effective and have lower cost of ownership than gasoline equivalents. As a result, EV adoption, and an “EV First” approach is now practicable and therefore legally mandated for much of our government fleet today. A full set of policy recommendations for improving compliance – from developing statewide EV training for public fleet managers and creating financing programs for construction of charging facilities to better defining EV buying requirements and imposing consequences for violators – are outlined in the report. The change to electric fleets, like all important changes to the status quo, requires an engaged citizenry, civil servants dedicated to implementing the law, and vigilant oversight by elected officials. By curtailing use of fossil fuels within government fleets, the report finds that Washington can achieve major reductions in carbon emissions and air pollution while improving health outcomes and supporting long-term economic growth. Coltura is a Seattle-based nonprofit organization working to accelerate America's transition towards clean alternatives to gasoline vehicles. Its goal is to spur adoption of clean, zero-emission vehicles, and phase out sales of new gasoline vehicles by 2030. 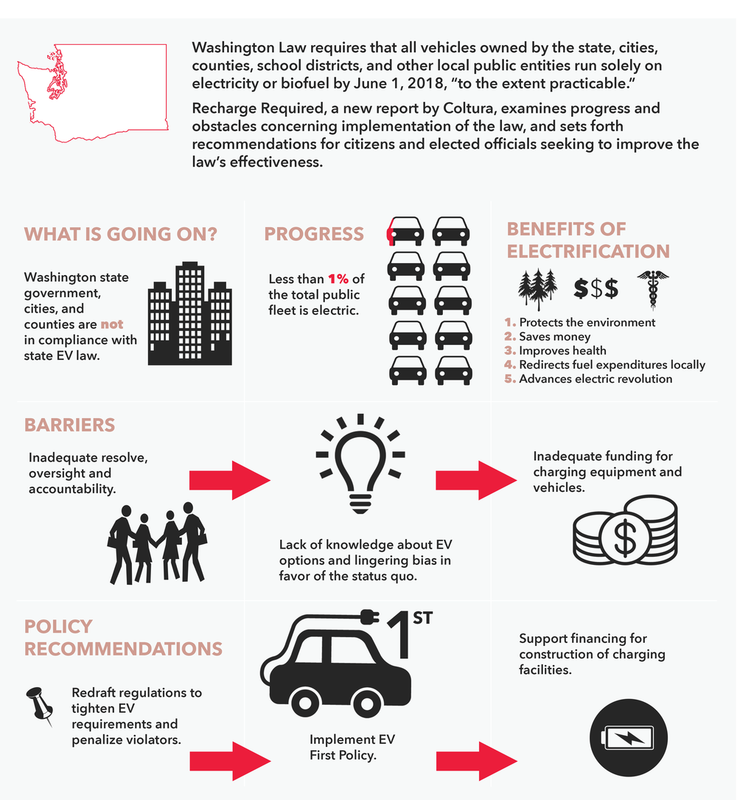 Its report Recharge Required provides a thorough examination of compliance with Washington’s public fleet electrification law. More information can be found at https://www.coltura.org/.